More luxurious than other St. John villas, Heaven’s Gate is ideal for a family reunion, an off-site corporate retreat, or a getaway with friends. Conveniently situated, the villa gives guests easy access to a number of beaches, local shopping spots, and great dining areas around the island. This is a great place to relax and forget the hustle and bustle of your daily routine. Whether you’re enjoying cocktails on one of the six private decks or sitting by the pool watching the sun set over Hurricane Hole, this home away from home will erase all of your stress and worries. Heaven’s Gate is a Mediterranean-style, two-level home bordered by stone walls, landscaping, and tropical views. 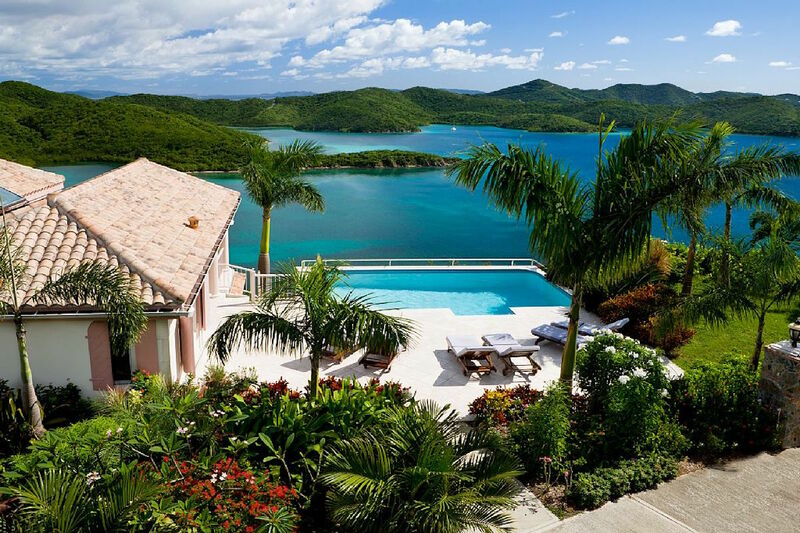 The privacy, tranquility, and natural beauty of this location are the best St. John has to offer. Heaven’s Gate Villa sits hillside overlooking Hurricane Hole, which is one of St. John’s most sheltered harbors. The harbor and hillside are part of the Virgin Islands National Park. Hurricane Hole has incredible snorkeling, and the National Park’s hiking trail leads to more snorkeling in Leinster Bay. Sunbathe anytime by the pool, which gets full sun all day and visual privacy. Relax in the shade on one of six covered balconies and take in the 180º view, which encompasses Hurricane Hole, Round Bay, and the south shore. For elderly and handicapped guests, the parking area, sundeck, and main level are all on one level. All interior and exterior floors, decks, walkways, and stairs are tiled with rare, imported Jerusalem limestone. Combined with the tiled roofs, Doric columns, and archways, the look is decidedly Mediterranean. Heaven’s Gate also has a private driveway with a gated entrance and security cameras. Guests enter the villa through the spacious Great Room, which contains the living, dining, and kitchen areas. The living and dining areas are furnished with antique mahogany furniture, French doors, and white Jerusalem tiles. A piece of stained glass, wall hangings, and valance lighting gives the Great Room a surreal ambience. In the living room, guests can watch movies on the 42-inch flatscreen TV and five-speaker Sony surround sound system. In the dining room, there’s a formal mahogany dining table and access to the deck. The kitchen is well-equipped with mahogany cabinets, granite countertops, a breakfast bar, stainless steel appliances, a blender, toaster, and a coffeemaker. All four bedrooms have air-conditioning, flatscreen TVs, DVD players, 800-thread Egyptian cotton sheets, ocean views, balconies, and ensuite bathrooms. Three bathrooms have outdoor showers. Two master bedrooms are located on either side of the Great Room, ensuring privacy. The other two master bedrooms are on opposite sides of the lower level, accessed by exterior stairs. Both levels have a spacious, public veranda between the two bedroom balconies. Heaven’s Gate’s large lot, lack of neighbors, and ideal location make it the perfect vacation rental for any small group. It’s less than 5 minutes from restaurants, bars, grocery stores, gas, and boat rentals in Coral Bay and 10-15 minutes from North Shore beaches. Cruz Bay is 20-30 minutes away, depending on whether guests take the direct North Shore Road or the scenic Centerline Road. Rates do not include: tax of 12.5%, damage waiver fee of $50.00. You will be greeted at the Cruz Bay ferry dock on St. John, taken to pick up your rental car and then escorted to the villa. One arrival greeting is included. You may schedule additional arrivals as needed for $100 per arrival. Cleaning fee of $150 + tax for stays less than 7 nights. Heaven’s Gate was the perfect home base for our trip to St. John. With four private bedrooms, two on the upper level and two on the lower level, it provided an ideal floor plan. The landscaping is immaculate and the pool was a very nice size for our kids. We really enjoyed waking up and sitting out on one of the porches overlooking the water. The kitchen was very nicely equipped if you are inclined to prepare meals at home. We did have a little trouble with the phone and TV’s, but it wasn’t a big deal because we were enjoying such a wonderful home. We found Coral Bay to be ideal for our family, since we are very laidback and enjoy the non-commercialized feel. We did find plenty of restaurants within 5-10 minutes of Heaven’s Gate. Our favorite was The Thirsty Donkey, but we also had very good meals at Skinny’s, Aqua Bistro, and Shipwreck Landing. We would certainly recommend Heaven’s Gate and hope to return as soon as the bank account allows. 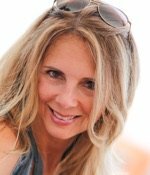 Our experience with Shawna was excellent as she was always on top of everything.